Today Dean Bragonier was able to video conference with Mrs. Lasenbug’s class. The students each presented to Mr. Bragonier a business proposal for the products that they created. 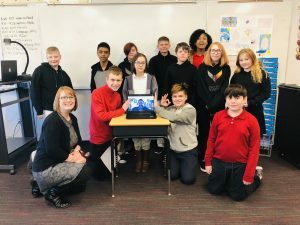 The students said that Mr. Bragonier helped them to stop and think about what the world needs and how they can help create a product to solve that need.Mr. Bragonier gave each student detailed and encouraging feedback on their presentations. After the presentations, Mr. Bragonier had a question and answer session with the students about the Noticeablity program. The students said that Mr. Bragonier was “super cool” and “funny”! They were excited that Mr. Bragonier had taken the time to video with them.